I don’t see any prices. How much do you charge for specialty, sculpted or novelty cakes? Each cake is a unique work of art that incorporates many exclusive details. That’s why offering a hard-and-fast price list isn’t reasonable. Prices vary greatly depending on size and complexity of the design. For specialty or novelty cakes, please contact us for a price quote. Our prices start at $5 per serving for a butter cream frosting base. A very complex design, intricate piping, handmade sugar flowers, custom figures, etc, will cost more, of course. 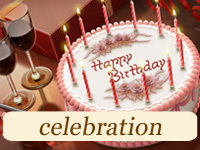 What is the minimum order price for specialty event cakes? 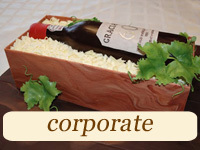 Specialty cakes include anything beyond a layer or sheet cake. Since each custom cake incorporates so many variables, offering a hard-and-fast price list is ineffective. Please contact us to get a detailed quote for your specific needs. What if I have my own ideas for a cake design? That’s great! Bring your ideas to the consultation, and we’ll make them into beautiful and delicious reality! Are your gallery items customizable? Yes, of course! The smallest size that we can customize is an 8” round. Can I order a cake with my grandmother’s recipe? If you have your own flavor or recipe in mind, let us know and we’ll do everything possible to make it. Our basic cake flavors are listed in our Menu section. We require a full 48hr notice for most orders and a week or more for special occasion cakes and large orders for weddings, corporate events, parties, etc. But what if I need a cake today? We do our best to accommodate last-minute orders when possible. Place an order over the phone to guarantee next-day or same-day availability. A rush fee may apply depending on size and complexity of the design. 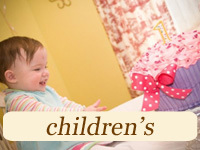 Click here for more information about last-minute orders. Can I make changes once my order has been placed? Please note that at least 48 hours notice is needed to change any standard order. Some designs require us to prepare fondant details well in advance in order to dry. So we may not be able to accommodate changes if these details have already been made. 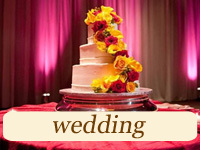 For wedding cakes, we require 3 weeks notice for any changes to your order. Yes. We require a 50% non-refundable deposit to reserve your event date and process your order. We accept Visa, Mastercard and cash. We do not accept personal checks. A deposit of 50% is required at time of order placement. Balance is required in full at time of delivery or pickup. If an order is not picked up on the day of delivery or delivery is denied, the client is responsible for the remaining balance. CupCakery will make every attempt to contact the client in case of a missed pickup date or denied delivery. If a cancellation is made less than 3 weeks prior, the balance is required in full. No changes can be made to orders less than 3 weeks prior to delivery date. Please note that delivery/pick-up time is final as noted on your invoice. Changes to delivery/pick-up must be confirmed no later than 3 weeks prior to event. if a cancellation is received, the aforementioned deposit will not be refundable. if a cancellation is received less than 3 weeks prior to the promised delivery date, the full aforementioned deposit and balance are due in full. Do you have a retail store where I can walk in and purchase desserts on the spot? Yes – we offer simple cakes, cupcakes, macarons, cake pops, petit fours and other desserts at our retail location. What kind of baked goods do you make? We make anything from a non-traditional or themed cake to a dessert table complete with mini cakes, assorted pastries, cupcakes, macarons, muffins, cookies, brownies, tarts, pies, cake pops and petit fours. Your cakes look amazing, but do they taste good too? Are they fresh? At CupCakery, we make all of our specialty cakes from scratch. That means we do not use any frozen products! All our desserts are fresh, delicious and elegantly looking. Yes. We only use fresh, natural ingredients, including real butter, milk, flour, sugar and eggs! I have food allergies. Does CupCakery make anything nut/wheat/dairy/sugar/gluten-free? Yes. We have a selection of nut-free, wheat-free, dairy-free, sugar free and gluten-free products to offer. We do our best to accommodate allergies by separating the order from others and sanitizing the equipment and tools used for the order. Please call us for more details. You can never have too much cake! Below is our size & serving chart for you to use as a guide. We offer cakes that serve up to 500 people. For larger cakes, please call or email us and our friendly staff will be more than happy to answer your questions. 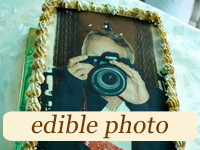 I would like a cake/cupcakes or cookies with a picture/corporate logo on it. Can you do that? Yes. We can print your pictures, corporate logos or images onto cakes, cupcakes and cookies. Contact us for more details. Call us for pricing to deliver to your home, office or other party location. We deliver to all of NYC, Long Island and maybe elsewhere. Yes, we do! Please contact us for wholesale pricing and other details. You can also use our convenient quote-request form.